We recommend that younger children should always wear a full body harness when climbing. The higher tie in point prevents your child from inverting (turning upside-down). A scary and off-putting experience for both you and your child, and potentially dangerous too. Beal Bambi Full Body Child's Harness is a simple and practical harness for growing climbers less than 40 kg in weight. By means of its 2 automatic adjustment buckles on leg loops and on the shoulder straps, the Beal Bambi Full Body Child's Harness adjusts perfectly and easily to all body shapes. 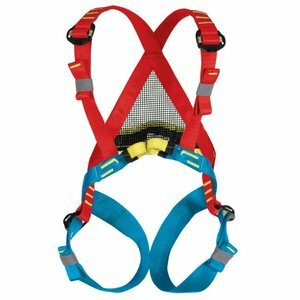 A colour code identifying body straps and leg loops helps when putting the harness on. Easy to adjust thanks to 4 autolock buckles. Easy to put on thanks to the colours of the webbings. Ideal for young children up to 40kg. When your child is older, they can graduate to the Beal Rookie Child's Harness, similar in style to an adult harness.